The sentences are too small. Drop shadow: it’s annoying and it’s not necessary and it’s bothered. 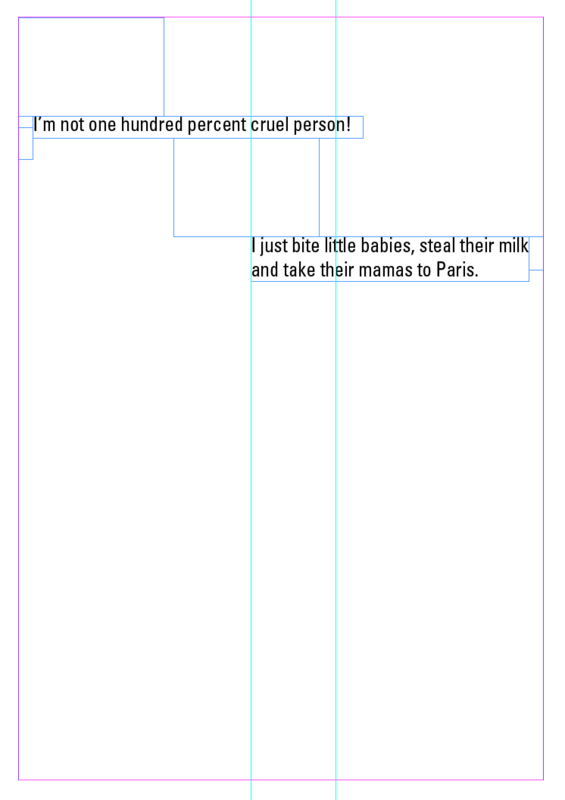 My poster was so symmetrical and I have to break up the rules, that was not interesting maybe because I follow the grid. My type was too large and I have to fix it. Break the idea of the grid. The drop shadow of the plate hiding the paragraph somehow so I have to bull it up. 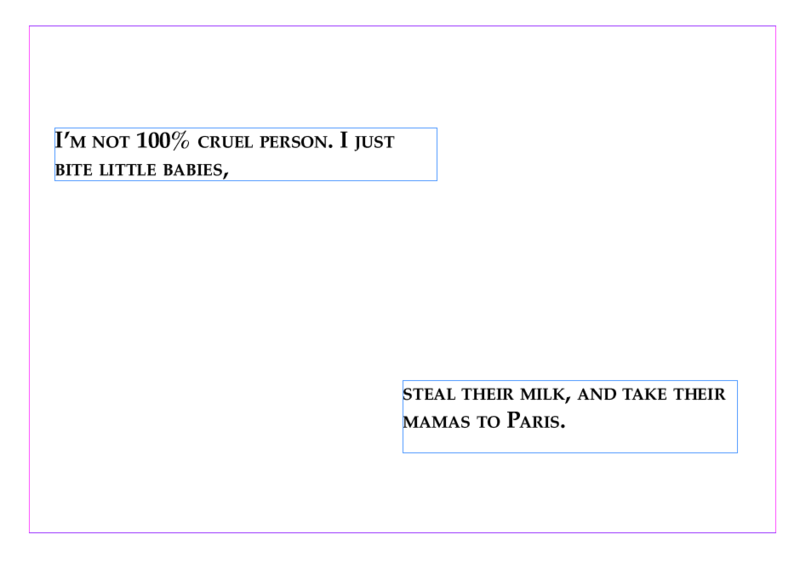 Basma gave me a really nice suggestion to put the sentence behind each other, and I think it will work well. Change the placement of the Arabic paragraph. We break the rules because of the concept. There’s always a concept and there’s always a reason! Concepts trans everything, concept is the thing that allows me to move in to doing the formal thing. It’s that articulation of contrast so the concept is contrast. It’s all about concept because when we first doing this we just pushing type around the page trying to figure out what’s going on! But once we figure out going on and try to anccur it with. Whenever we get staked for ideas just come with a concept because that is the first limitation. (Limitation is a thing that allows me to build from). As so as I figure out the concept it becomes so much easier. Because system built from concept. Contrast in the page to make it interesting, contrast is important, it’s much more important to contrast with the paragraph and it’s easy more than with the sentences. Contributing all the previous knowledge. The last project was challenging, and not hard. Negative space always a good space. We have to always think about how to control the audience. ( hierarchy). The hock are first, it’s important than everything. Because my paragraph is small it can fir in the plate area. I could coloring the sentences or paragraph but I have to chose color from something relates to the poster but I have also to make sure not to grab the attention too much to itself like probably a red and I don’t want the audience to grabs their attention except the hock. The way I’m handling my sentences is actually quite interesting. So I could start from up and go to the brownies and I can put it in a little box but I actually didn’t like boxes I feel it’s bothering. The paragraph it could be over the flowers or I could put type around the beginning of the paragraph I couldn’t do like this because that would compete with that and it conflx with this too much. The paragraphs works really good. I already work in a smart way as low said because I already alien it the area that I could put information in so it actually starts underneath here ….. The problem was I wasn’t working on A1 the size of the actual poster. Logo: it could be half that size 1.5 cm, and it should be black and white. I can put it somewhere down and it could live up and it could fit in somewhere that sort of dynamic. I don’t want to grab the attention. If it’s big it will grab too much attention and I don’t want it to be like that. With the final project we have to combine the all projects we’ve done on to poster, by putting them all together. 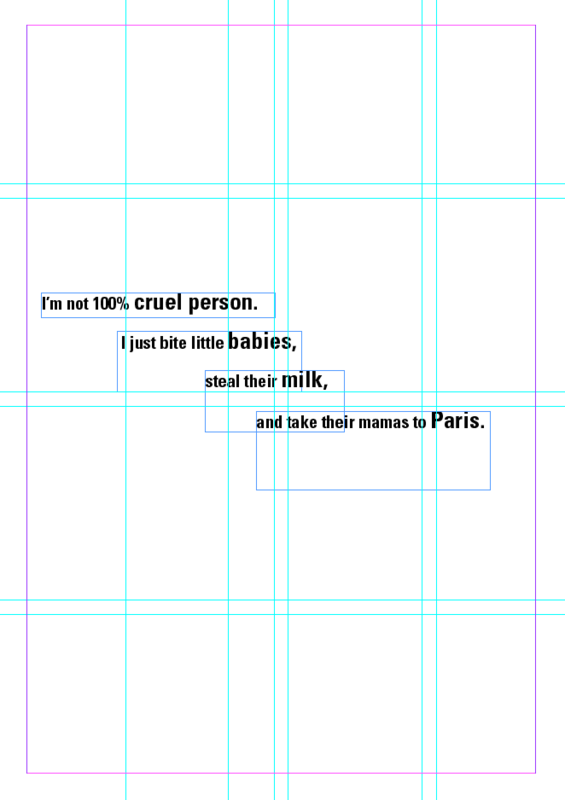 This was my first experiments as I tried to placing them next to the word by following the grid. I feel like I’m lucky because my poster is white, and I have so much space in it, so that I could play with the sentence and paragraph. Sentence and paragraph they are really different piece, sentences are very different context as a paragraph the things we get used to think about it is paragraph which we will be dealing with most. Don’t treat the sentence like a paragraph and don’t treat a paragraph like a sentence. That happens, because we assumed to done it very fast because we done sentences and we save that for paragraph and when we got a paragraph we forgot everything. The connections is the most important thing that when we actually learned when we make decide decision and we must make sure that we catch that our writing when we talking about this project and our reflections. The first part of the project was so interesting when you were asking us to find an article, story, poetry, etc. For me it was so fun, maybe because my word was ‘Happiness’ and there are lots of stories, poetries, articles that talk about happiness. I actually learned so much when I was searching for the write meaning or for the appropriate paragraph. Also, this project is actually easier than the ‘sentences’ I think because we get used in it and maybe because the sentences were too short we couldn’t play with it. However, we learned a lot with the ‘sentences’ project that helped us to avoid so many things in paragraphs. I learned that the concept is the most important and how to break rules and not to be afraid. I also learned how to use drop caps and to pay attention to rags and rivers and it actually distorts paragraph form. I wasn’t sure about the Arabic and Latin typefaces! Kufi typeface is always my favorite one, I tried to match it with Bodoni typeface but I fell like it’s not matching because kufic has a lot of curves lines. However, kufi style is optimized for reading Arabic script. I actually liked working with two different language, the important thing that I was thinking about while doing this experiments is “placement”. As we know the Arabic language writing starts from the right of the page and continues to the left so I get a little pit confusing. The second thing was how to matching types so I stuck with Kufi typeface and Bodoni! Paragraphs are an essential element of turning text. The divide the content into logical, digestible bits, organizing the information, which in turn helps keep the reader engaged. One of the most common paragraph indicators is the basic indent. This method effectively draws the eye to the beginning of each paragraph without causing a major disturbance to the flow of text. The basic indent is almost standard for lengthy text, such as books and magazines, as it maintains the overall color and texture of the typography while being space-economical. Separating paragraphs with a line space is other frequently used method. It provides a strong visual prompt that can be useful in instances that benefit from the addition of breathing room to either enhance readability, or to support the overall layout and design. This techniques does tend to break up the flew of the text, so should therefore be reserved for shorter text settings that will benefit from additional emphasis. A very distinctive look can be achieved by using an outdent, or hanging indent. This extends the first line of first few lines of a paragraph into the left margin. The greater the depth of the outent, the more dramatic the effect. This treatment can become the hallmark of a particular design solution. Choosing to align text in justified, centered, or ragged columns is a fundamental typographic act. Each mood of alignment carries unique formal qualities, cultural associations, and aesthetic risks. Justified paragraphs: they can lead to gaps or Rivers, to correct it use a long line length. Flush right paragraphs: should be used with caution as they are unconventional. Centered paragraphs: should be reserved for very intentional and specific use. The distance from the baseline of one line of type to another is called line spacing. It is also called leading, in reference to the strips of lead used to separate lines of metal type. Metric kerning used the kerning tables that are built in to the typeface. When you select metric kerning in your page layout program, your are using the spacing that was intended by the type designer. Metric usually looks good, especially at small sizes. In this project, we had to find two paragraphs – 150 words minimum-Arabic and English by using the antonym (opposite meaning) word we used in the second project. My word was تعاسة (miserable) and the opposite meaning is سعادة (happiness). The paragraphs can come from poetry, novel, article, fairytale and books. 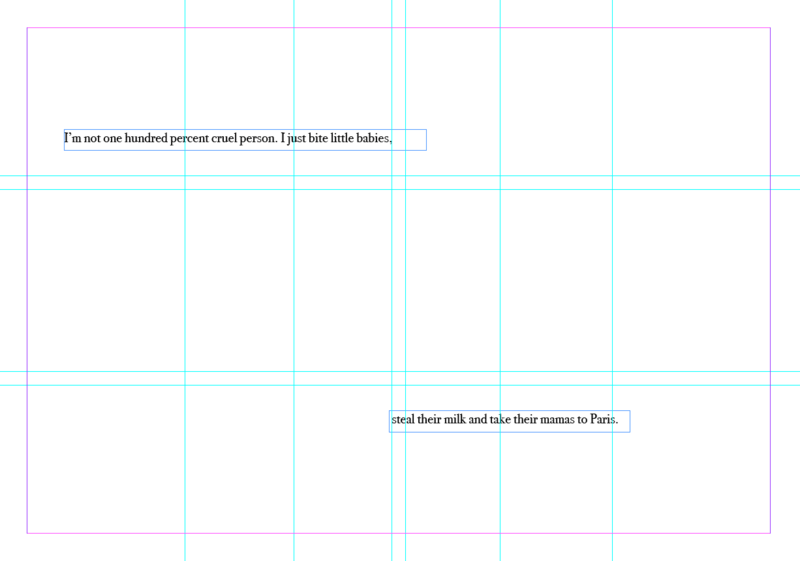 Within those paragraphs we have to start typesetting text in InDesign and experimenting different variation such as placements and composition. ارتبك الفتى واعترف له بأنه لم يرى شيئا؛ كان همه ألا يسكب نقطتي الزيت من الملعقة، طلب إليه الحكيم العودة مرة أخرى للقصر. عاد الفتى يتجول منتبها إلى الرائع الفنية المعلقة على الجدران، شاهد الحديقة والزهور الجميلة. عندما رجع كان قد شاهد الأشياء ولكنه اكتشف أن قطرات الزيت قد انسكبت. سر السعادة هو أن ترى روائع الدنيا وتستمتع بها دون أن تسكب قطرات الزيت، فالسعادة حاصل ضرب التوازن بين الأشياء. الاستمتاع بالفرص الصغيرة ومنحها حقها من الوقت والحضور يحول الحياة إلى مجموعة من الفرص السعيدة الصغيرة والكبيرة، لا تتطلب ما وراء الأشياء، ولا تتعمق في التساؤل عن مغزاها، لئلا تهرب منك لذتها. When you wake up each day, you should be filled with excitement because you know the day is going to be full of great things. You are meant to be laughing and full of joy. You are meant to feel strong and safe. You are meant to feel good about yourself and know you’re invaluable. Of course there will be challenges in your life, and you are meant to have them too, because they help you to grow, but you are meant to know how to overcome problems and challenges. You were not born to struggle. You were not born to live a life where the moments of joy are few and far between. You were not born to toil in your work five days a week, with fleeting moments of happiness on weekends. You were not born to live with limited energy, feeling exhausted at the end of each day. You were not born to worry or to be afraid. You are meant to be victorious! You are meant to be happy! You are meant to have an amazing life! Left aligned type is the most common form (note how even this text is aligned to the left) and for a good reason. It’s the most easily legible and gives a nice, neat left edge to the text. When in doubt, left align. Right aligned type does what it says on the tin, it aligns the type to the right. This is mostly used for decorative purposes within branding or small pieces of type in certain publications. Right alignment isn’t recommended for large chunks of text, though as it can get hard for the eye to follow, the ragged left edge makes it slightly more difficult to find a new line. Soap needs salt to make it tastier, however, to much salt ruins the soap. Font too small or too big. We have to respect typefaces at all sizes. If I use bold, it has to be a reason for it and it shouldn’t be used too much. “Paris” doesn’t have to be bold, we were talking about how we should choose key moments in type in our sentence and emphasize those. For example, emphasize 100% cruel person might to be bold, and might like little babies or mama to Paris or something like that. There also to be a reason to it, like is it because is the key part of my sentence! I have to decide where is my key part. There is not intention here. 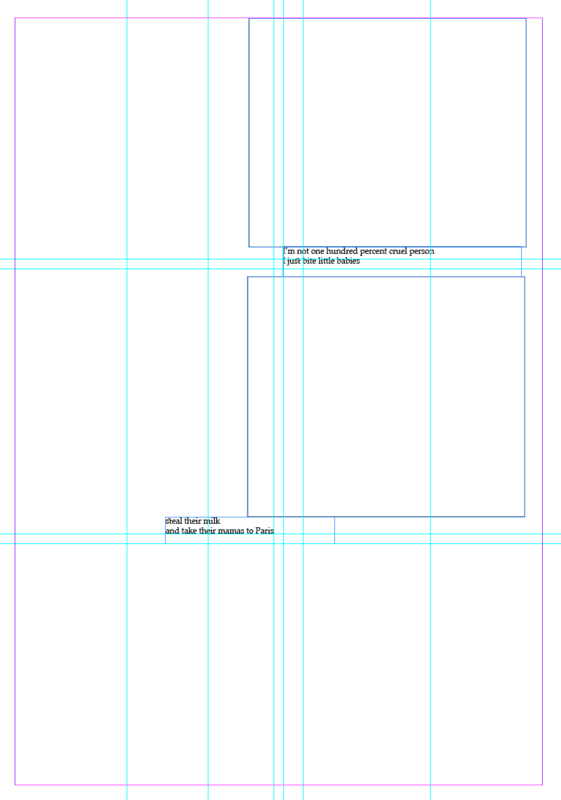 The other thing is, if I did this in A4 and I moved it on to A3 I just automatically think if I scale this it gonna work. It won’t. I still have to go in. It doesn’t really hit any areas that make sense. It’s just like laying on the page. I have to grouped these together and then hold them closer. The problem is that I got 4 different groups they are not really grouped together like fitting together and in the same time there’s no other groups. Spell out (percent one hundred percent) like that because this just stands out like a sour thug in the composition. It’s very odd looking. I can have one chink and the other chink then where to live in a page more interesting. These are key area’s in some way activate and so that might be a matter of putting here sentences, it sort of touch that line. I should give compositions that activate with in around that area.